Ternopil Volodymyr Hnatiuk National Pedagogical University has recently celebrated 395-th anniversary of its founding and 75-th anniversary of Ukrainian pedagogical establishment revival in a picturesque town Kremenets of Ternopil region. This is one of the oldest higher education institutions in western Ukraine, which is now established as a recognized education and culture, science and methodology centre of pedagogical education in Halychyna. According to the results of Ukrainian higher education institutions consolidated rating the university ranks the second among pedagogical universities. It has received International Academic Popularity and Quality Rating “Zolota Fortuna” laureate diplomas.During its functioning the university prepared more than 65 000 specialists for general secondary, professional, higher education institutions. Thousands of our graduates became recognized professionals in the field of education, researchers, known both in Ukraine and abroad. 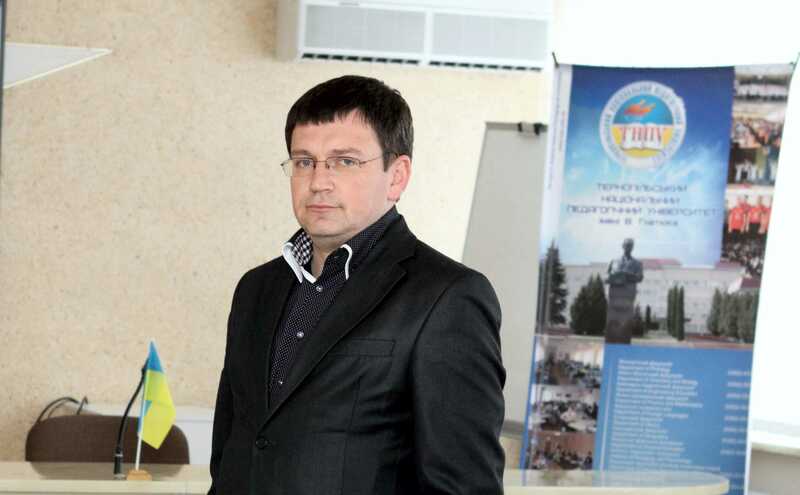 Many of them are professors at Ukrainian higher education institutions, government officials, public figures. Among them are famous researchers: academician of the National Academy of Science of Ukraine Bohdan Danylyshyn (Faculty of Geography), corresponding members of the National Academy of Pedagogical Sciences of Ukraine Hryhorii Tereschuk, Valentyna Radkevych (Engineering and Pedagogical Faculty), doctors of sciences Vasyl Hrubinko, Nadiia Drobyk, Alla Stepaniuk, Svitlana Pyda, Volodymyr Kurant (Faculty of Chemistry and Biology), Liubov Struhanets, Zoriana Lanovyk, Mariana Lanovyk (Faculty of Philology, Faculty of Journalism), Roman Horbatiuk, Ivan Tsidylo (Engineering and Pedagogical Faculty), Vasyl Brych, Lesia Zastavetska (Faculty of Geography), Bohdan Buiak, Mykola Moskaliuk, Lesia Aleksievets (Faculty of History), Iryna Zadorozhna, Lilia Morska (Faculty of Foreign Languages), Yaroslava Kodliuk, Maryna Orap, Vira Polishchuk, Oksana Kikinezhdi, Oleksandra Yankovych, Nataliia Oleksiuk, Ivanna Parfanovych (Institute of Pedagogy and Psychology); Hero of Ukraine, director of agricultural enterprise “Ukraine” Oleh Kryzhovachuk (Engineering and Pedagogical Faculty), People’s Artists of Ukraine Viacheslav Khimiak (Faculty of Philology), Oksana Pekun (Institute of Pedagogy and Psychology), Honoured Artist of Ukraine Oleksandr Papusha (Faculty of Philology), Olympic champion Olena Pidhrushna, Sochi Olympic Games participant Dmytro Pidruchnyi (Faculty of Physical Education), lieutenant generals Mykhailo Tsymbaliuk, Mykhailo Koziar, major general Petro Zhytar, politicians Oleh Barna (Faculty of Physics and Mathematics), Stepan Barna, Yurii Syrotiuk (Faculty of History), Ihor Pober (Faculty of Physical Education) and many others. Students’ football team won European University Championship and has been winning Ukrainian Championship awards for the last seven years.Special attention is given to faculty professional development. The University graduate school (aspirantura and doctorantura) is functioning successfully. 38 faculty members defended Doctor of Sciences dissertations and 253 faculty members defended PhD (Kandydat of Sciences) dissertations. It has already become a good tradition for our graduates to seek employment at the university. 68% of teaching staff, 100% of Rector’s Office staff, 58% of all deans, 52% department chairs, 55% of all doctors of sciences are our alumni. These figures demonstrate the university high research potential and quality of education.We are proud to state that university has evolved as research and study, science and education centre of Ukraine, a site of international and all-Ukrainian research conferences, congresses, readings, etc., a place of 5 specialized academic councils, with of them awarding Doctor of Sciences degrees, a testing ground for many Ukrainian higher education know-how. Students are offered a wide range of specialities they can choose from during the course of study and the number of specialities on offer is growing every year. Institute of Pedagogy and Psychology, nine Faculties, University Preparatory Centre and Centre of Further Education are offering their academic programmes to students. 38 academic departments employ 469 faculty, including 1 full member and 1 corresponding member of the National Academy of Pedagogical Sciences of Ukraine, 3 academicians of the Academy of National Higher Education of Ukraine, 53 doctors of sciences, full professors, more than 340 associate professors. Almost 7 000 students are engaged in full-time and correspondence study. University education is based upon the coordinated system of professional orientation. 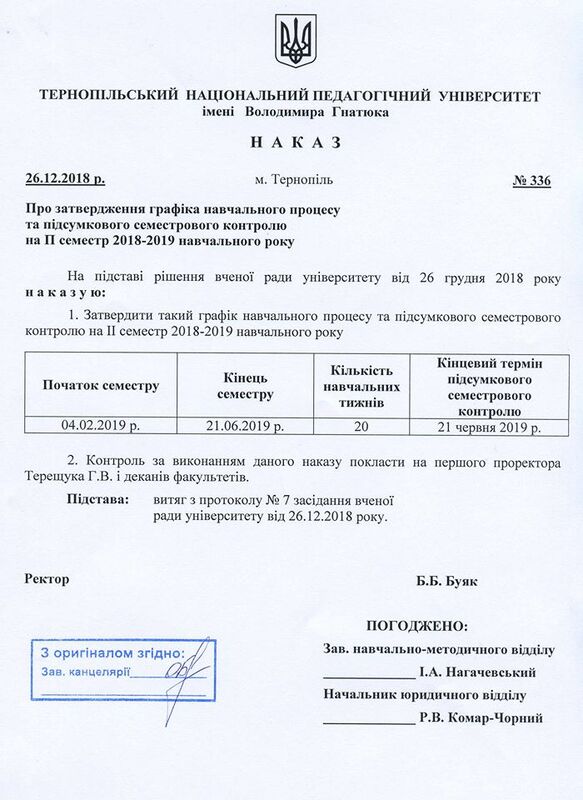 Correspondence School of Mathematics aims at selection of future Mathematics teachers among gifted students of Ternopil region and other regions of Ukraine. Study and research complex comprising Taras Shevchenko Regional Humanitarian Pedagogical Academy in Kremenets, Olexandr Barvinskii Humanitarian Pedagogical College in Chortkiv, Markiian Shashkevych Pedagogical College in Brody, Ternopil In-Service Teachers Training Institute under the auspices of the University has been functioning since 1995. Its activity promotes level preparation of educators in Ukraine and quality selection process of potential pedagogical university entrants.The content of curricula and academic programmes at both undergraduate and graduate levels has been revised and updated with the implementation of credit-transfer system of study, computer technology, licensing of new specialities. Our students regularly participate in and win all-Ukrainian Olympiads.The University cooperates with partner universities abroad, such as V. Frankel Higher Pedagogical School named in Carinthia (Austria), University of Saskatchewan and University of Waterloo (Canada), Warsaw University, Higher School of Linguistics and Jan Dlugosz University in Czestochowa (Poland), South Czech University in České Budějovice (Czech Republic). There are 35 agreements of cooperation with universities in Europe, Canada and the USA at present.The international activity of the University is actualized by international scientific communicative forums and exchange of students’ government leaders. International students’ conferences have become a tradition. This year the theme of the conference was “Public sector and students’ government as a part of Ukrainian society development” and students from Poland, Norway and Belarus were active participants.During the year the University staff implemented two projects in context of the Tempus Project TEMPUS ELITE – “Education for Leadership, Intelligence and Talent Encouraging” (02.12.2013 - 31.12.2016) and the project “Cross-media and Quality Journalism” with partners from Germany, Austria, Romania, Moldova and Ukraine.Thanks to the signed agreement of cooperation with Higher School of Linguistics and Jan Długosz University in Czestochowa a Double Degree Program that provides possibilities for simultaneous studies in Poland and our students receiving diplomas of two higher educational establishments is implemented. 80 students of our university have already received Polish diplomas. The growth and strengthening of relationships between institutions is promoted by TNPU membership in international organizations, namely:• Consortium of Ukrainian universities and the University of Warsaw (since 2008);• Association of Rectors of pedagogical universities in Europe;• Magna Charta Universitatum (The Magna Charta of European Universities), thus joining 775 universities in the world guided by common fundamental principles in their activities (since 2013).Success is assured by constant attention of the University administration to logistical support of educational process. We have study rooms equipped according to modern standards, laboratories with visual aids and computers. Students can use libraries with necessary manuals and textbooks, special literature, spacious reading rooms, a virtual library of educational and scientific works. For the convenience of the library visitors the department of scientific and technical information and automation is created, electronic catalogue and electronic versions of publications are significantly replenished.University computer network connects all academic buildings and students’ halls of residence with fiber optic complex, which provides access to the Internet. Each student has free access to electronic library funds and electronic versions of our courses as well as database of other institutions and information centres. Wireless network using Wi-Fi technology is functioning to provide rapid access to internal and external resources via the Internet with the help of mobile devices.We introduce new forms of students’ independent work, their consistent and systematic learning online. MOODLE learning management system, which allows faculty to create their unified subject courses, has been launched.We believe that organization of educational process is closely connected with providing good living conditions for students. There are 5 modern halls of residence, six gyms, sports complexes and tourist centres, an internet cafe, sanatorium, where more than a hundred people can improve their health. The University provides opportunities for professional mastering specialities and specializations, allowing graduates to feel confident in the labour market, creating conditions for mastering innovative teaching and information technologies. In general, today we concentrate our efforts on training highly qualified specialists, young, educated people whom our society needs in times of rapid development of science.Students and faculty of the university took active part in the Orange Revolution and Revolution of Dignity; they provide financial support to Ukrainian soldiers in the fight against our common enemy. It is not a mere coincidence that our university graduates head the regional council and regional state administration, and it was our National Pedagogical University that President of Ukraine Petro Poroshenko visited.